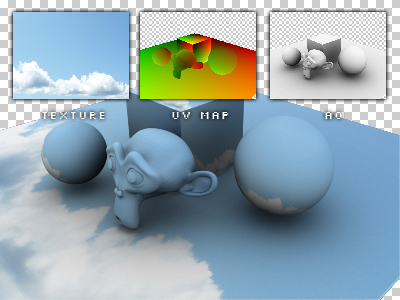 This plugin allows you to add or replace textures on 3D renders by using a UV map. It can also be used to add reflections using a Normals map. UV and Normal map can be easily rendered with any 3D application. The plugin is meant to be applied onto your UV map. Input 2: this is the texture that will be used. As you can see, there aren't too many parameters, but this plugin does work for some simple re-texturing.